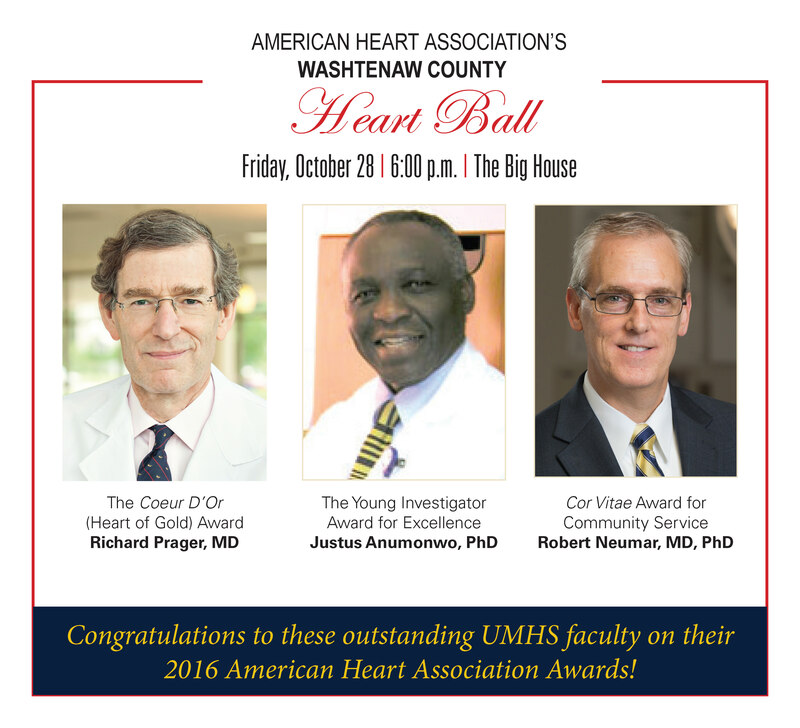 On Friday, Oct. 28, the American Heart Association will honor three U-M physicians as recipients of 2016 Washtenaw County Heart Ball awards. The Heart Ball celebrates and recognizes the incredible advances in medical science and the lifesaving work of the AHA and is chaired by UMHS physicians Dr. Gabe Owens and Dr. Sonal Owens. Richard Prager, MD: The FCVC Director and Richard and Norma Sarns Research Professor of Cardiac Surgery will be presented with the esteemed Coeur D’Or (Heart of Gold) Award for Excellence. Dr. Prager joined the Department of Cardiac Surgery in 1999 as the head of the section of adult cardiac surgery at the FCVC. Over his career, Dr. Prager has established himself as an outstanding clinician and leader, resulting in his well-deserved status as one of the leading heart surgeons in the state of Michigan and beyond. Dr. Prager’s leadership has extended beyond the operating room and into a prominent role in outcomes research. He has led the state of Michigan’s initiative in improving quality outcomes and data reporting for cardiac surgery and has also served in an important national leadership capacity through the major cardiothoracic surgical societies. Dr. Prager is currently President-elect of the Society of Thoracic Surgery. Justus Anumonwo, PhD: The associate professor in the Division of Cardiovascular Medicine and the Department of Molecular and Integrative Physiology will receive the Young Investigator Award for Excellence. This award will be given to Dr. Anumonwo for his early career accomplishments which have made great strides in the advancement of cardiovascular research. He has specific expertise in the regulation of cardiac ion channels, with a deep knowledge of molecular and cellular techniques of relevance, such as patch clamping. He has published more than 40 original papers and is widely recognized for his contributions as both an independent investigator and a collaborator in the area of cardiac ion channels and the mechanisms of cardiac arrhythmias. Robert Neumar, MD, PhD: The professor and chair of emergency medicine will receive the Cor Vitae Award for Community Service. Dr. Neumar is a founding member of SaveMiHeart, a nonprofit initiative in Michigan uniting the community, first responders, EMS systems and health systems to improve cardiac arrest survival. Dr. Neumar’s research is focused on the molecular mechanisms of neuronal injury after cardiac arrest and traumatic brain injury. He currently serves as chair of the American Heart Association Emergency Cardiovascular Care Committee and as an AHA delegate to the International Liaison Committee on Resuscitation. Congratulations to these outstanding faculty on achieving these honors! For more ticket and general information on the 2016 AHA Heart Ball and the Pulse afterparty, please visit the event’s website.